The bar is now two days away, and I'm taking a brief break (in between Torts and New York Practice--mmm.....) to bring you a little Sunday scrapbook love. I made this page for the newest challenge over at Who's that Girl--the other girls have made some amazing pages, so pop over at check it out! 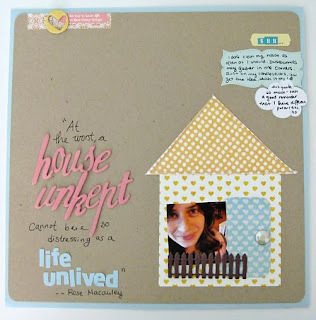 This page highlights new favorite quote: At the worst, a house unkept cannot be so distressing as a life unlived" (by Rose Macauley). As someone who does not clean her house with any sort of inspiring accuracy, I fully appreciate quotes like this. Amen, sister. 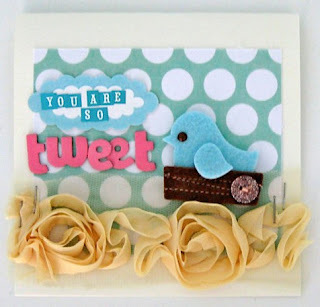 This next one is a sweet little card I whipped up, with no particular purpose in mind. I am loving the yellow Dear Lizzy ribbon but trying to find more ways to use it--it has a lot of presence on a project, and I don't want it to be overwhelming. How have you used this product? I have many posts percolating in my head, but duty calls.....I will be mostly out of touch this week, since the bar is Tuesday and Wendesday, but I look forward to being back to blogging afterwards! Oh! I forgot to say GOOD LUCK on the Bar!!!! Nice looking new blog!! :) Lovely page and good luck! What a great blog you have! I really love your blog header and the clean design you have. Good luck on the Bar Exam!! love the new banner! what fun! i used to live up in your neck of the woods. BAR EXAM? Yikes. My hubs could probably give you a word or two about that. GOOD LUCK! Good luck on the BAR! Love it! I just got some of this ribbon in! I need to force myself to use it. Good luck on the bar! My little sis has to take it next year. You'll do great! so so cute! Love the fresh, clean and sweet look of the 1st layout. Great quote. I can fully appreciate that one too! Good luck, I am sure you'll do wonderfully! Fantastic work, just love that card! Good luck on the Bar Keshet!! You scap and study for an exam like that...forget the cleaning girl, you've got other fish to fry! 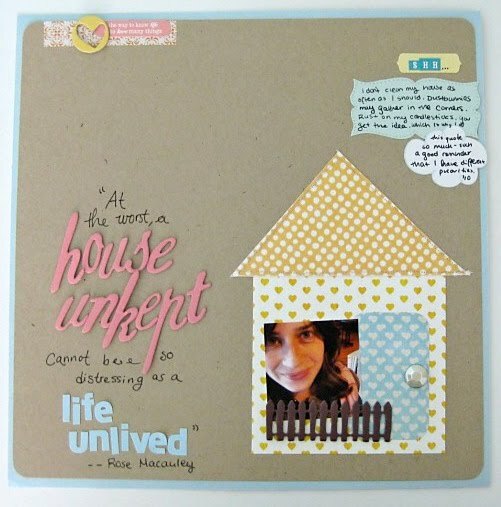 I love your projects, especially that little house you made. Brilliant. I am terrified of that Lizzy ribbon, I know I will not exercise the proper restraint as you did on your card. Adorable projects, as always - and GOOD LUCK with the Bar!!! Those are SO cute. Like, "i wish they were MINE" cute. I am amazed at you being able to be right-brained creative even while studying for the bar. NICE! Oh, cute page & card!! :) And all the good page ideas come when you're too busy to scrap them, don't they?? lol. Too funny that we had similar posts...and housekeeping skills:) GOOD LUCK on the Bar!!! Very cute page and card! Best of luck with your studying! I love that quote, too. I have to admit that I have thought of that sentiment before, but never thought to say it so eloquently. :) I would rather scrap than have a cleaner bedroom. that's the truth! Ha! that reminds me of a cute quote - a clean house is a sign of a dull woman - or something like that. Really cute page. that house is so darn cute! and i looooove the card!!!!!!!!!!!!!!!!!!!!! seriously in love with this post .. the pretties ..
Love the LO!! Brilliant idea using the house shape! 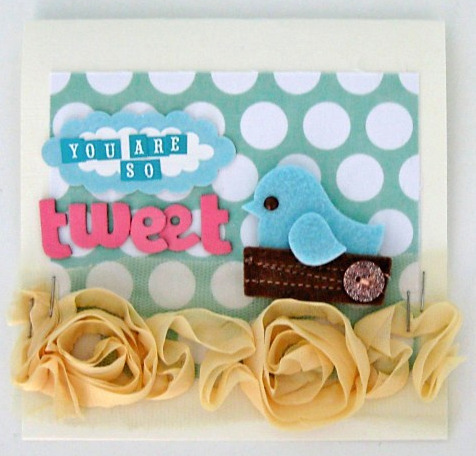 Your card is so sweet with that adorable yellow ribbon! Thanks for stopping by my blog! Wish you luck on your exam!! Good Luck on the Bar. Love your layout, I love that quote. I hope the Bar went great! Love what you shared. That card is precious! Keshet- just wanted to come over here and thank you a whole bunch for following my blog page. I appreciate seeing your comments all the time! I hope once you have finished the Bar and get some time to update I can return the favor! How cute is that house?!! Oh I'm sure you did well in the exam but I will keep my fingers crossed for you. I bet you are relieved to have it all over with & start a new chapter. Congrats on the bar being behind you!